Ever since The Craft (1996) gave us Rochelle, I think many young brown ladies who used the film as the staple, go-to for sleepovers hoped for more characters like her. Unfortunately, not much enhancement or regression has occurred in seeing Black female characters on screen using the dark arts for their will. The exception of American Horror Story: Coven's Queenie and even Marie Laveau has been cautiously entertaining at best and disarmingly stereotypical at worst. MisSpelled, created by writer and actress Lindsey McDowell is a brand new web series where five enchanted young women at a community college grapple with their unique abilities and discover each other. She was inspired by some familial roots to develop a series for herself and friends who were being unfairly typecast in the industry. MisSpelled debunks size two standards and shows, quite refreshingly, multiplicitous ethnic backgrounds. In the promologue, Gladys, Emma, Quinn, Stella, and Nina are well established and intriguing enough to tap into the essence of a teaser. You desire to see more in admiration of a fun, well-paced, well-written story. Its technical savvy is impressive and shows care for the product. 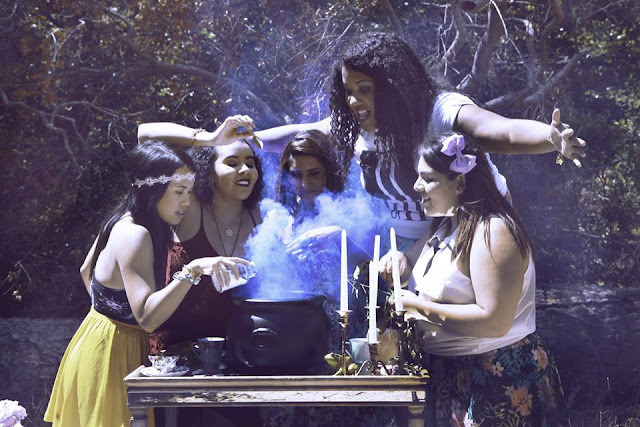 Overall, MisSpelled manages to successfully market itself as the answer to women of color in witchcraft stories, conjuring character traits that are relatable and exploratory. Be sure to keep tabs on this series via the YouTube channel, Twitter and Facebook! Watch this whimsical introduction and tell us what you think!